Get ready to hack and slash whilst tripping balls, Travis Strikes Again: No More Heroes has finally been unleashed onto the world. Join Travis as he goes on perhaps his most weirdest adventure yet as he gets sucked into the Deadly Phantom Games console, the Death Drive Mk II. We also have the official press release for Travis Strikes Again: No More Heroes. It announces that there is a patch on the way which will include a new opening cut-scene and some information about a particular stage in the game. 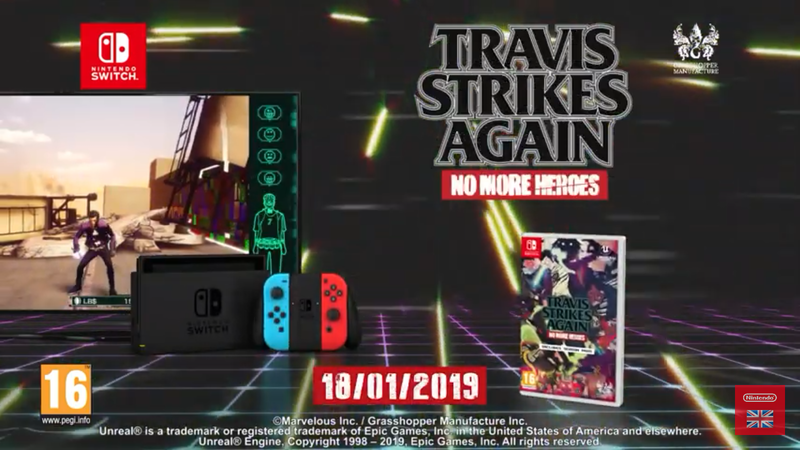 Grasshopper Manufacture Inc. (Head office: Chiyoda-ku, Tokyo, Japan; CEO: Goichi Suda) is proud to announce the release of the Nintendo Switch exclusive action game Travis Strikes Again: No More Heroes today, Friday, January 18th, 2019. The return of Garcia & Johnson: One of the game’s stages, “Serious Moonlight”, is based on the hit title Shadows of the DAMNED! “Serious Moonlight”, one of the games playable on the in-game console of legend known as the [Death Drive Mk II], is a battle-action game based on the 2011 release Shadows of the DAMNED, for which Goichi Suda took the helm as Executive director. This stage was created from the world of Shadows of the DAMNED. In this game, main character and demon hunter Garcia has died and his former partner Johnson the skull, reborn as a hero, appears as the character Eight Hearts. A patch will be made available seven days after release, and will add a new opening movie. In-game collaborations with legendary titles! In accordance with the game’s release, we also wish to announce a new collaboration with a few especially legendary titles, stage information, and additional patch contents. In addition to the 54 indie game collaboration T-shirts available in the in-game T-shirt shop, two more titles are now being added as Legendary Collaboration T-shirts: The Legend of Zelda: Majora’s Mask and The Legend of Zelda: Majora’s Mask 3D.